The rendezvous point for our Secret Paris Food Tour is next to the Temple Metro station. I’m a few minutes early and am happy to soak up the Paris sunshine until our man, carrying an orange umbrella, appears. Our guide’s name, appropriately, is Christophe Boulanger and he comes armed with a bag of Parisian pastries. 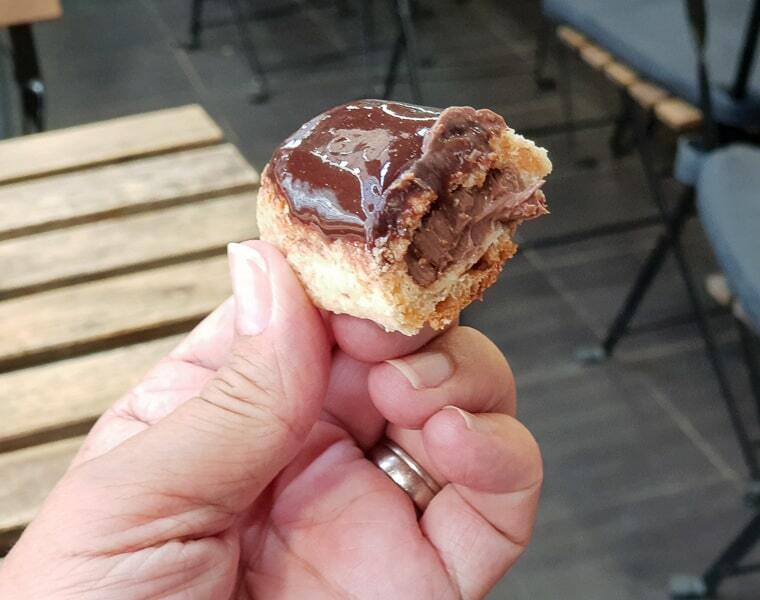 We nibble on the Chouquettes, sweet, bite-sized choux pastries, while the group assembles before heading off on a mouth-watering Le Marais Secret Food Tour. 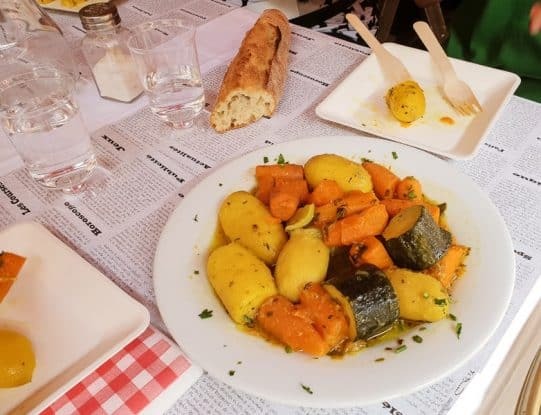 We head to nearby café Le Tour du Temple for something the French do best. Coffee and croissants. We introduce ourselves amid the aroma of fresh coffee and warm croissants. There are nine of us. 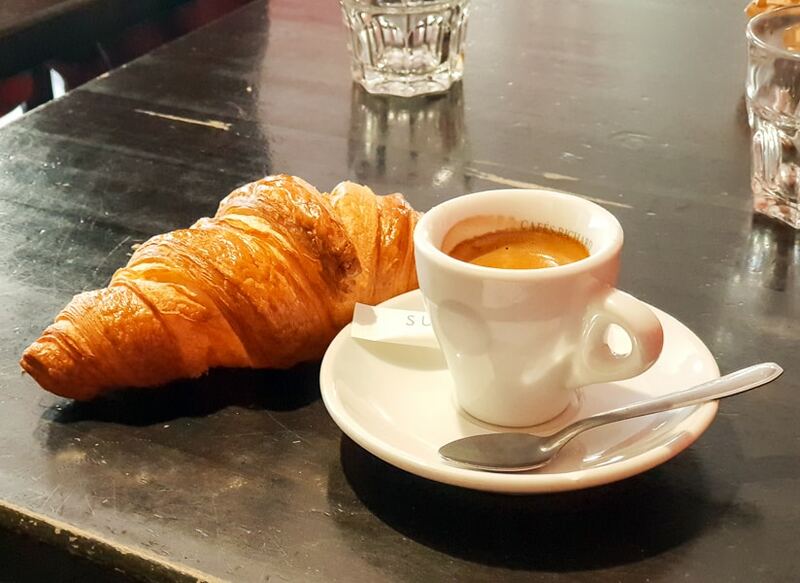 The coffee’s good and strong and the croissants are deliciously buttery, flaky and crisp. The croissant is thought to have originated in Vienna with the crescent shape a reference to Ottoman flags and victory over a Turkish invasion in 1683. Bakers working all night heard the Turks tunnelling into the city and sounded the alarm. The crescent-shaped croissant is usually made with butter. We learn that not all croissants are created equal. Other shapes exist and some are more likely made with margarine if you want the real deal order Croissant au beurre. 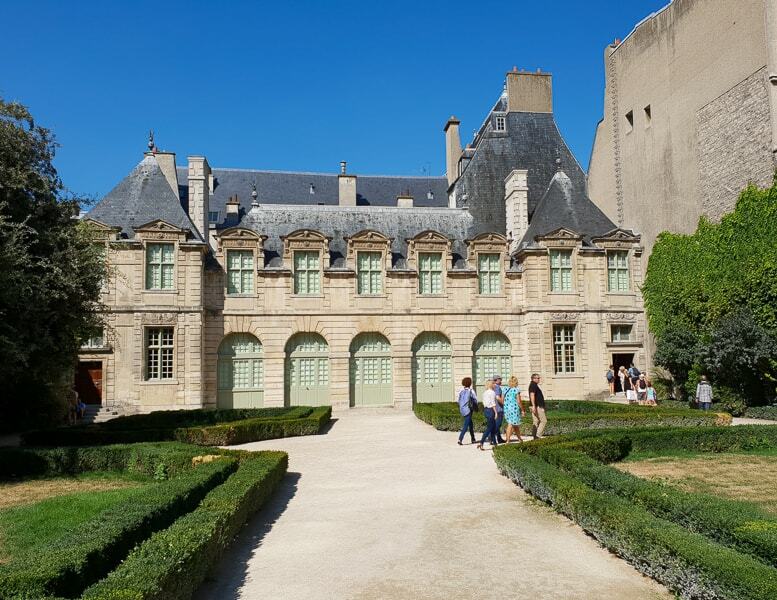 We wander through the medieval streets of Le Marais with pointing out architectural features. We see exposed beams, the metal hoops on doorways to stop carriage wheels scraping the walls. The streets can be aged by its balconies because there were none pre 1860. Le Marais means ‘the swamp’. It used to be marsh land before but was drained in the twelfth century. 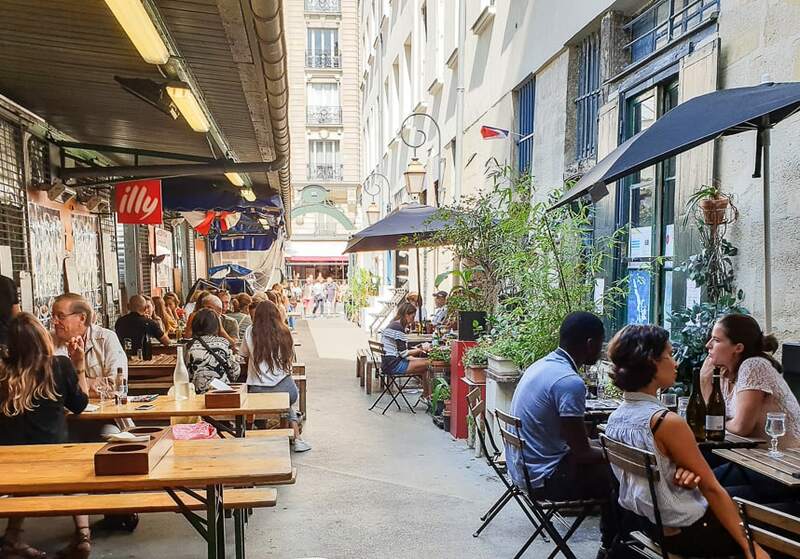 It’s now one of Paris’ trendiest, artsy areas packed with boutiques and restaurants. 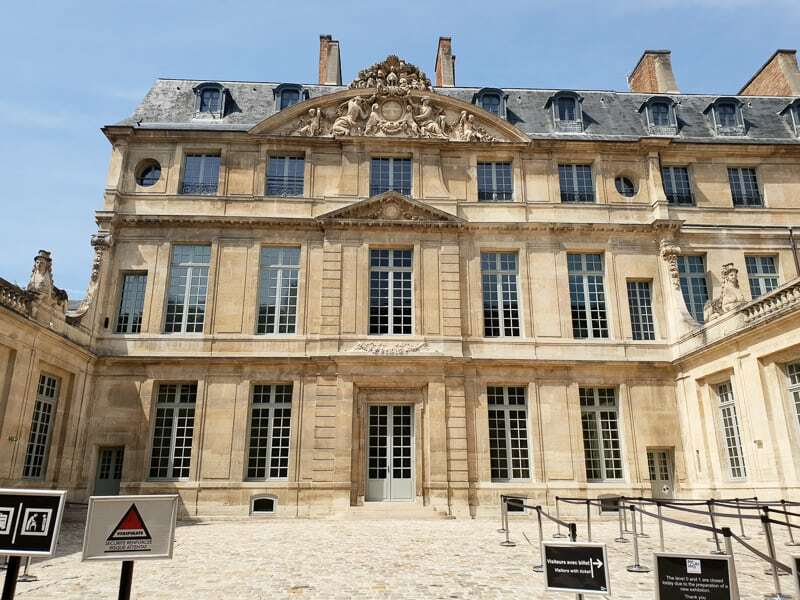 The beautiful Place des Vosges is a highlight of Le Marais along with several mansions and museums including the Musée Picasso and the Maison de Victor Hugo. 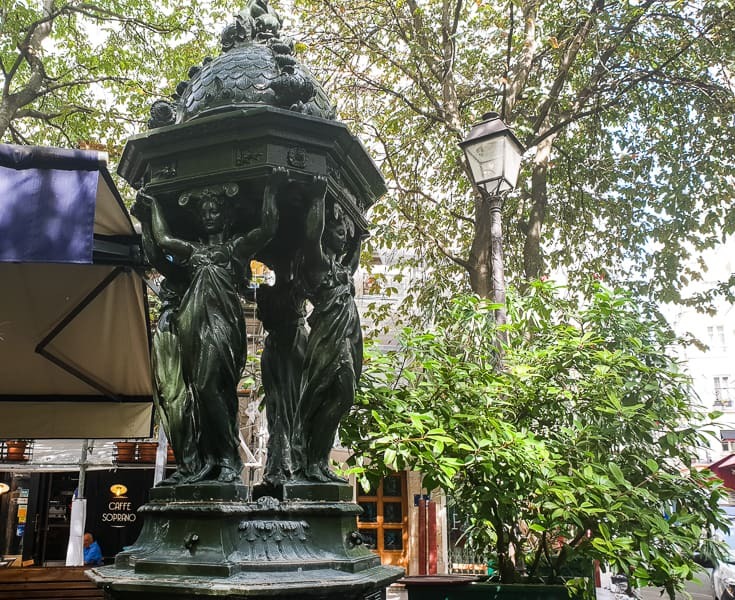 A symbol of Paris are the cast-iron Wallace water fountains which are scattered all over the city. You can fill up your re-usable water bottle from mid-March to mid-November (they’re stopped during the winter to prevent damage from ice). An Englishman, Wallace, funded the public fountains in 1872 to aid the poor of the city and Charles-Auguste Lebourg designed them. Each mademoiselle stands in a slightly different position and each possesses a different virtue; kindness, simplicity, charity and, aptly, sobriety. 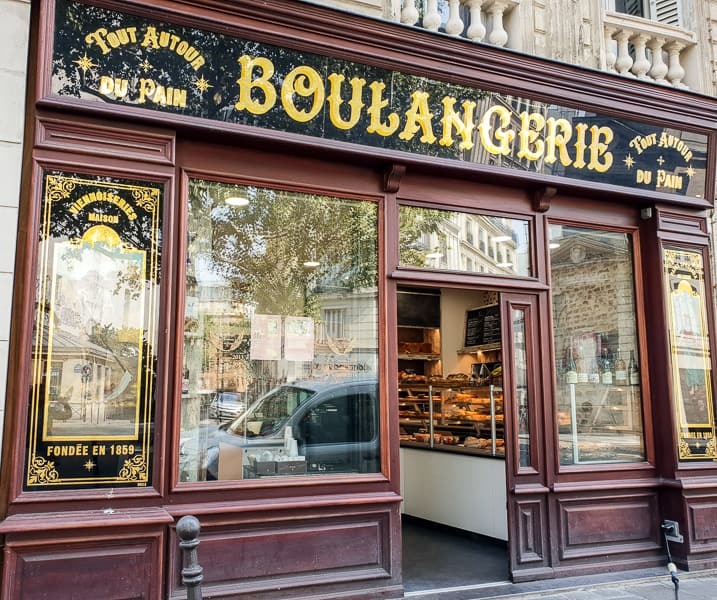 The next stop on our Paris Food Tour is award-winning boulangerie Tout Autour du Pain. 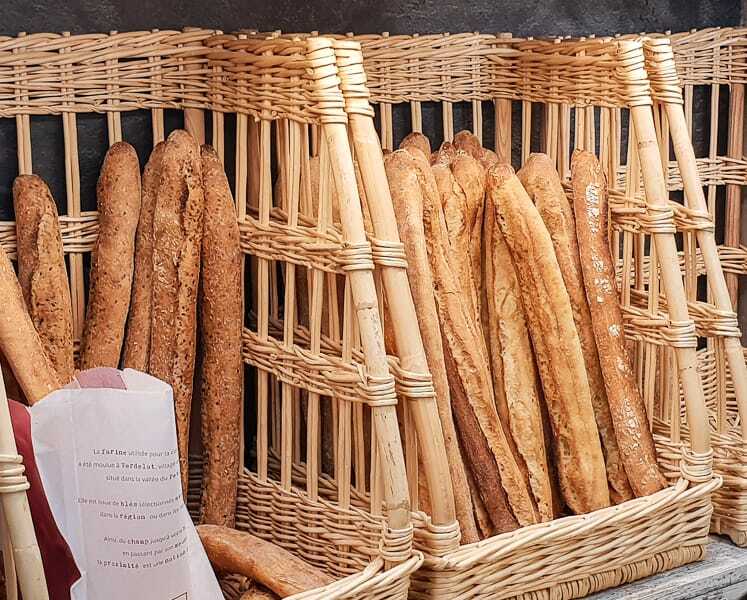 There’s an annual award for the best baguette in Paris and Tout Autour is this year’s winner. The prize is €4,000 together with the honour of supplying the President with baguettes for the year. The best baguette is a fresh baguette, no more than 2-3 hours old, and should crack nicely as you twist it. Ours does and it tastes delicious. The baguette was created in Paris at the end of the nineteenth century when workers arrived in the city to build the Metro. Lunch included bread and wine but a combination of language barriers, wine and knives to cut the bread meant there was always going to be trouble. The baguette was designed to be twisted which eradicated the need for knives. This put an end to violent disputes. 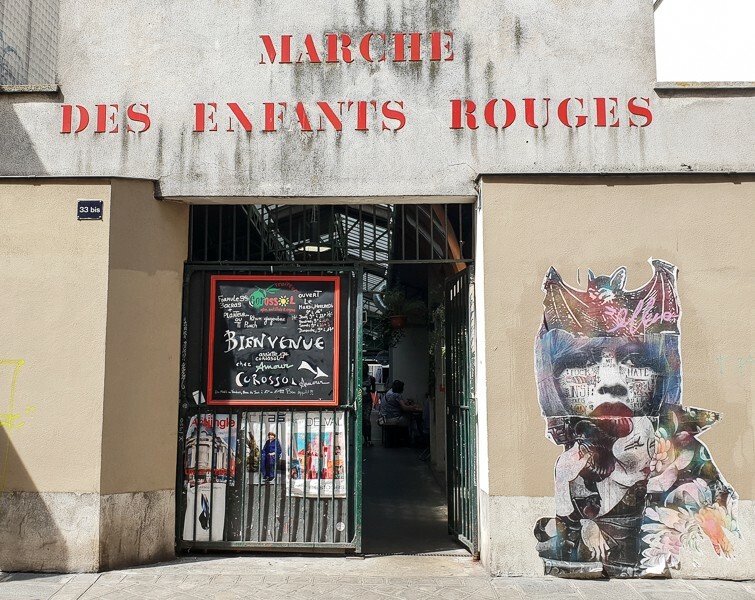 A short stroll finds us at Paris’ oldest covered food market the Marché des Enfants Rouges dating back to 1615. Translated it means Market of the Red Children and refers to the children who lived in an orphanage that once existed on the site who dressed in red – the colour of Christian charity. Sensory overload kicks in as we enter through the iron gates of the market. It’s colourful, busy and full of wonderful aromas and good food. The market sells some produce but we were there to sample the delights of the food stalls. Before sitting down to eat we spent time checking out the variety of cuisines. 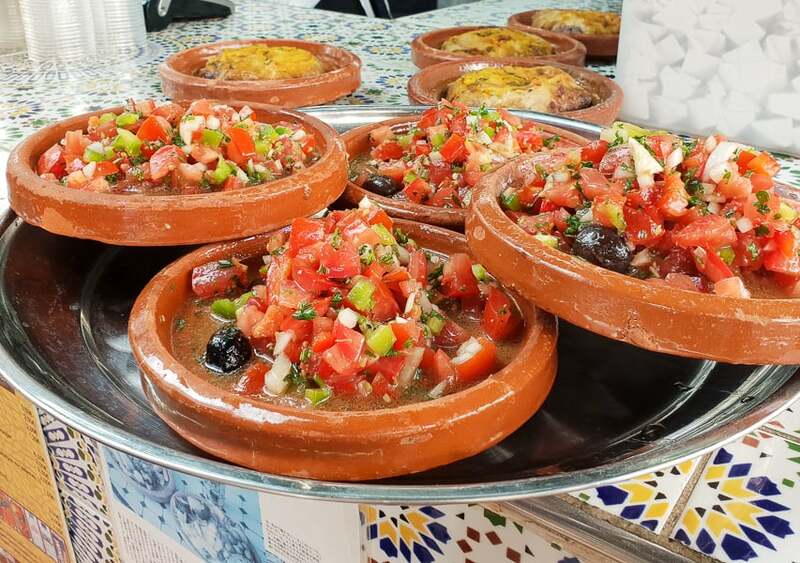 Moroccan tagines and couscous, Caribbean and Mediterranean food. Each stall has its own set of tables and chairs and we sit down to eat at Bio Wagner in the corner for some organic vegetarian food. 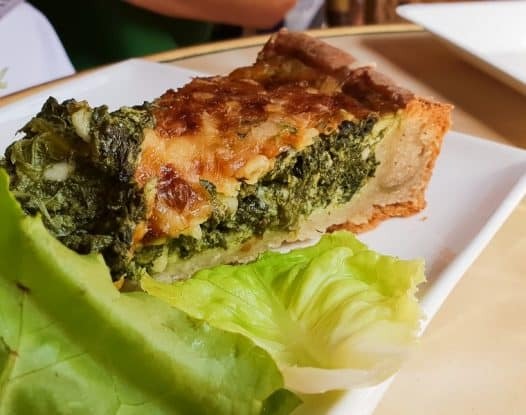 First up we all dip into a shared plate of hearty stewed vegetables followed by bites of tasty spinach and cheese quiche. The French aristocrats would never have eaten food from the earth they were far too posh and only ate meat and birds. The cheese stall La ferme d’Inès beckons next and this is where the baguette comes into its own. We try five different cheeses on thin slices of the gorgeously fresh bread. 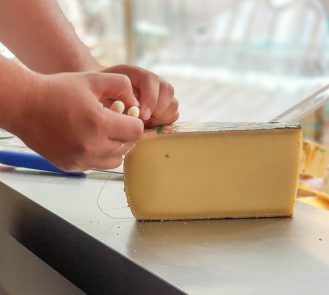 Fromage de Brebis du pays Basque, made from sheep’s raw milk, is followed by a taste of Chèvre aux fruits, this time it’s a goat’s raw milk cheese. The third cheese is Comté one of my all-time favourites followed by a blue cheese, Roquefort. 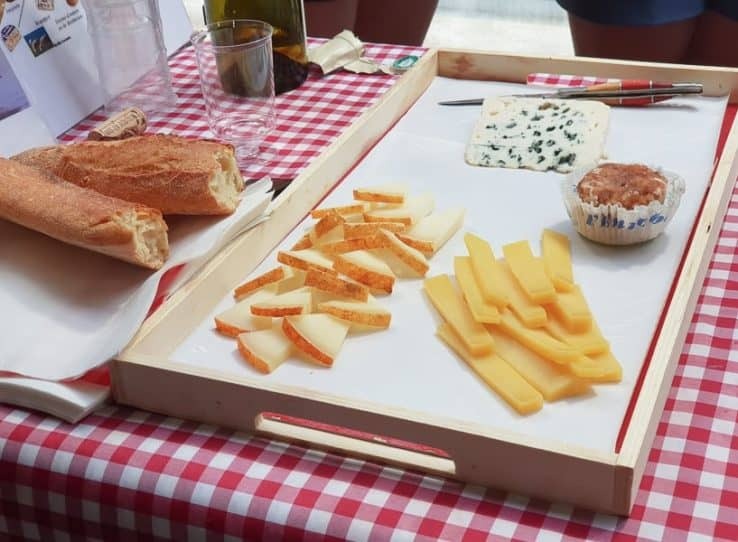 Our final cheese on our Paris food tour is an absolute revelation. 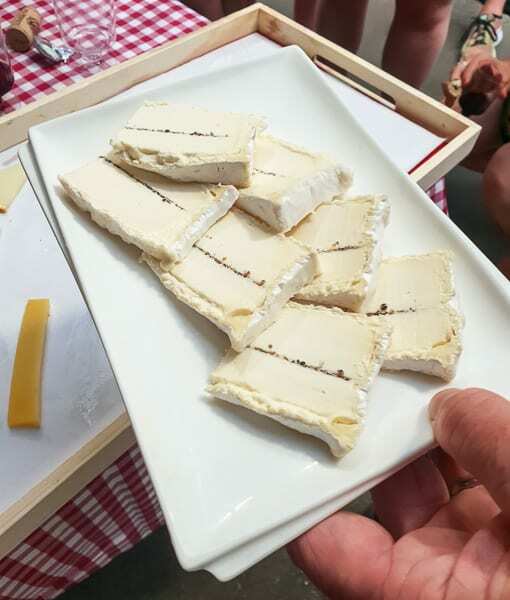 ‘Brillat-Savarin à la Truffe’ is a soft Brie type cheese made with triple cream and black truffle. We have to guess the special ingredient but it doesn’t take long. Truffle is one of my favourite flavours and quite distinct. The cheese is absolutely divine. It’d be wrong to have cheese without wine so we sipped on Ocellus Abbaye Fontfroide, Corbières and a Domaine Elevin Petit Chablis which accompanied perfectly. We pass the Picasso Museum, previously Hotel Salé, and Christophe points out some interesting features about the building. The left-hand wing at the back of the building is actually fake and is just a 1ft wide wall designed to look like the genuine wing opposite. They had a thing about symmetry in those days but you’d never notice the fake wing if you didn’t know. I’m so stuffed by now that I’m beginning to think I won’t be able to eat for the next two days. Until we arrive in the Jewish Quarter. Christophe drops into Chez Hanna and comes out with a tray of warm spicy Falafel. Well it’d be rude not to. Rue des Rosiers is full of Jewish delis with queues of tourists outside most of them. There’s a reason for that. The atmosphere’s full on and the falafels are fabulous. Our final stop is for dessert. 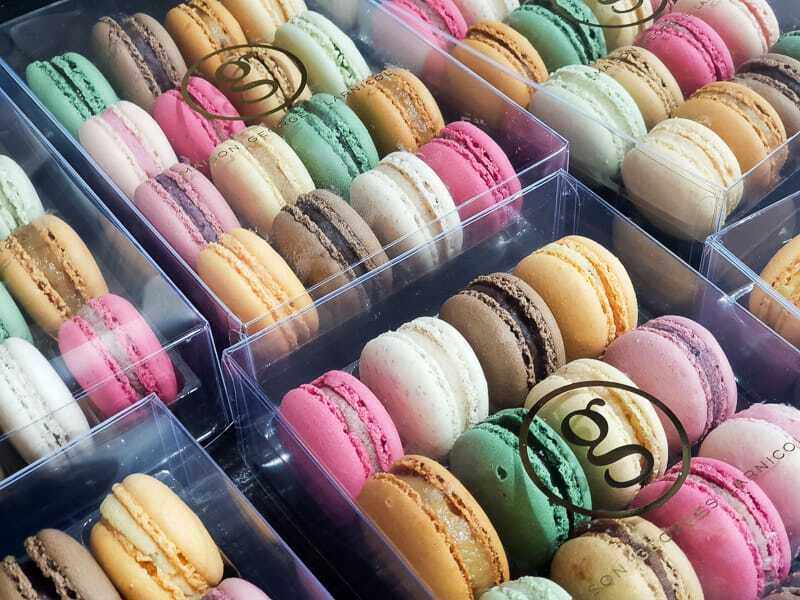 We choose two macarons and two chocolate treats from the renowned George Larnicol chocolate shop. The delicious smell of chocolate is almost overwhelming and it takes a while to make my choice. I can’t possibly squeeze in any more food so Mr Jones and I enjoy them later in our quirky Paris hotel room with a glass of bubbles. The perfect end to a perfectly piggy day! The tour took almost almost four hours and finished at St Paul metro station. 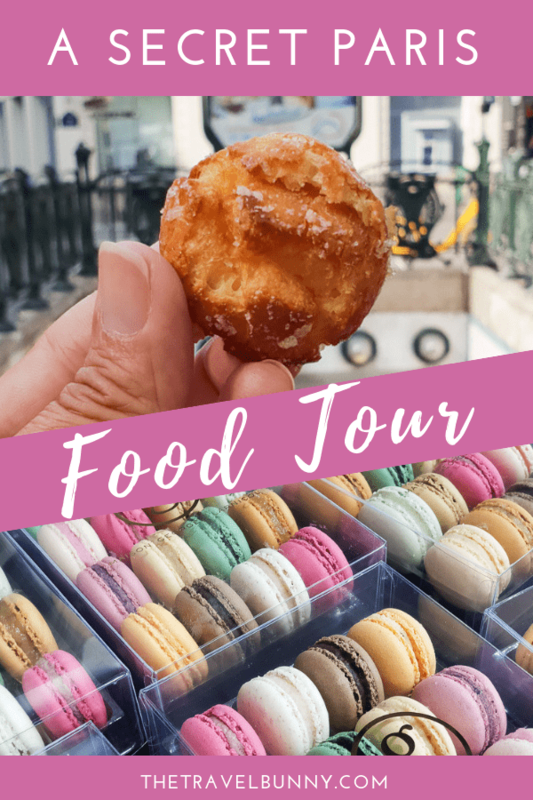 The Secret Le Marais Food Tour took us on a fabulous culinary and cultural encounter in one of Paris’ most enchanting districts. 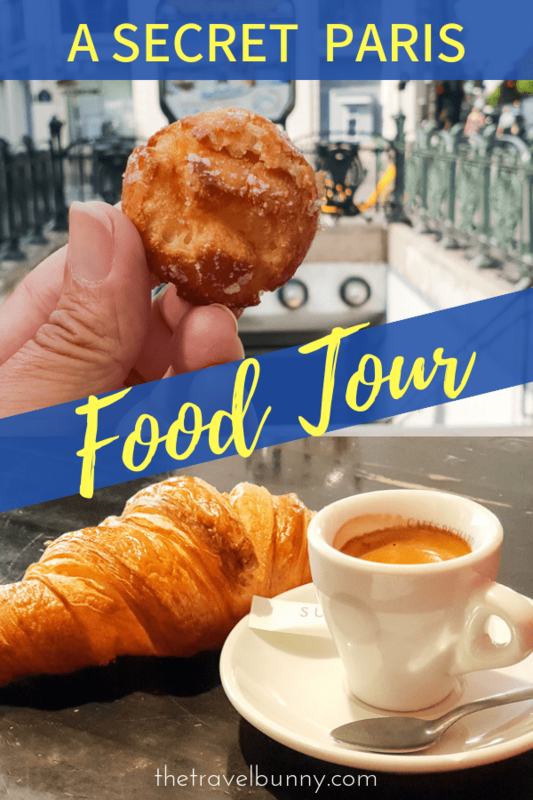 Many thanks to Secret Paris Food Tours who hosted me on the Le Marais Food Tour. All opinions, thoughts, and calories consumed are entirely my own. Ugh I was just in Europe and was not able to make it to Paris! It’s still on my bucket list and an excuse to go back! Great pics! I hope you visit Paris soon – you could easily fill a month exploring the city! Wow, Paris looks amazing. The beautiful architecture is breathtaking and gives such a romantic vibe. The cheese looks so delicious. 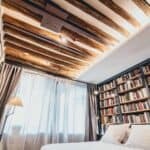 I have always wanted to visit Paris and this post makes me want to visit even more! Paris is always a good idea! Love that quote because it’s absolutely true and Paris is stunningly beautiful! Hope you visit soon. 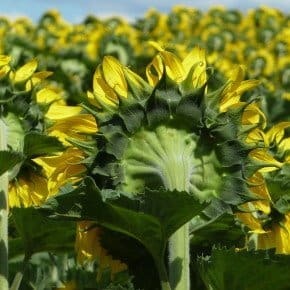 You have so many beautiful photos of France. Each is more aesthetically pleasing than the next. And the food itself makes me want to book a flight immediately. I must say Paris is a place I have been meaning to visit for a while now, and these pictures only increase my desire to go! Everything just looks so pretty, and the macaroons look delicious. Paris is a beautiful city. 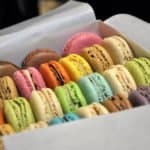 I hope you go soon and get your fill of macarons! Yum yum yum Suzanne. 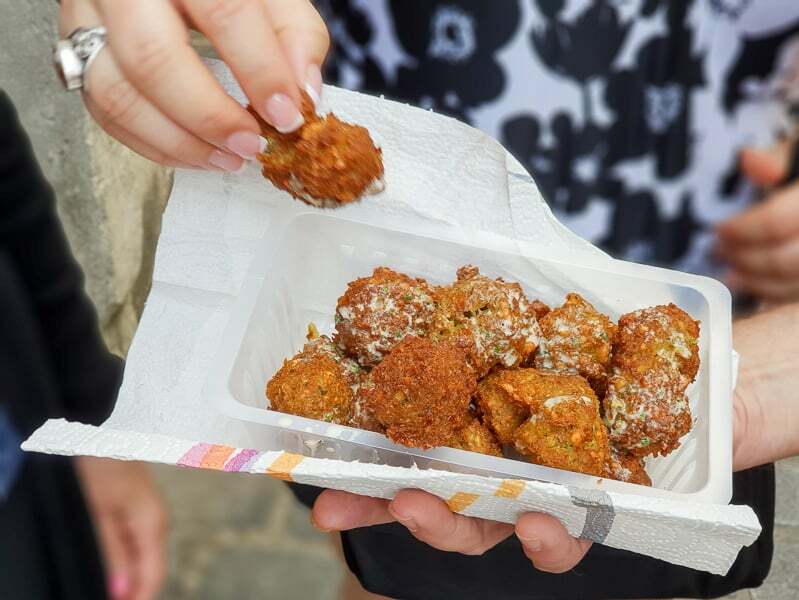 Gotta love those falafels. Who knew you’d score some good ones in Paris? And they were good! There are about six falafel shops all in a row! 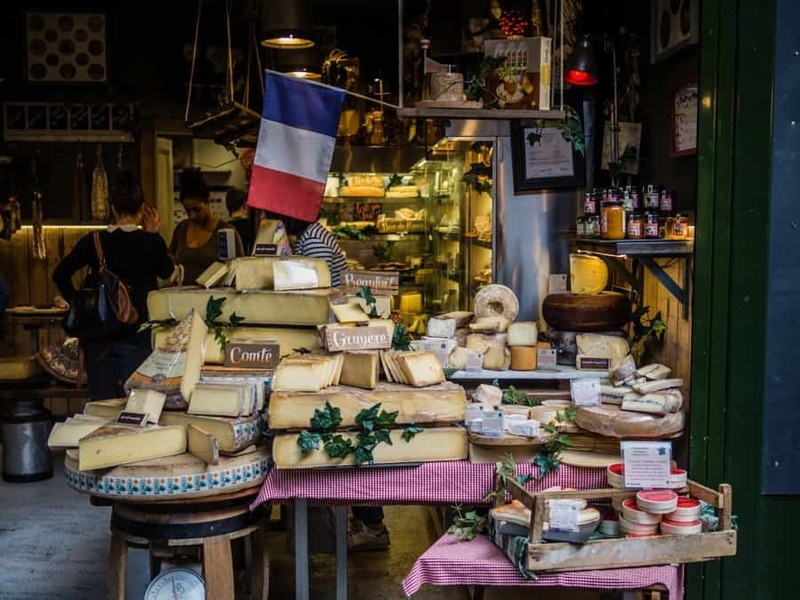 The Marais is a lovely part of Paris and this looks like a brilliant way to explore it – so much good food! We stuck mainly to Le Marais during our two day stay. It was good to get a feel for one area instead of spreading ourselves too thinly. I think a visit to Paris every year to stay in a different district would be a great way to discover the city. This is your kind of tour! I’d love to visit Vienna and try the kipferl there. I’ve heard good things about the coffee houses there. It definitely ticked all the boxes! Wow! 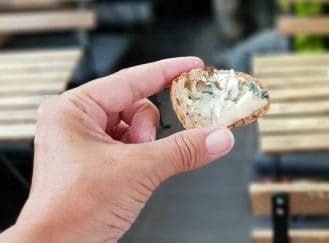 I’ve done a couple of food tours in Paris, and I hate to say it, I was disappointed with them both. This, however, looks fabulous! I’ll be booking this next time I go for sure. Yum, now I am hungry! 😉 It looks stunning, what an amazing tour. Ahh but there was so much more – this is just a little taster! This looks like such a great your. I’ve been on some disappointingly basic ones that most lead you to a few places in one tiny area, no history of architecture or context to the are and the food. I love the area of the narrat but haven’t read much on the history so isI love to try all these testst whilst learning all the way. Great reconnection l recommendation! It was an excellent tour Kavey. 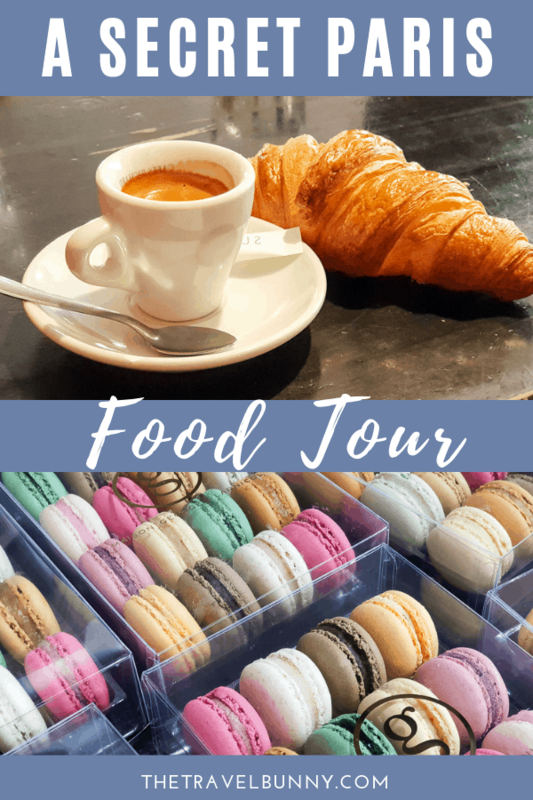 I love a food tour that’s just about the food but this was so much more and gave us a fascinating insight into life in Le Marais in times gone by. 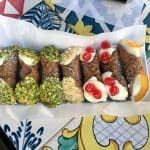 This looks an amzing food tour and I always love a food tour. I am definitely going to do this next time I got to Paris! and the market through the iron gates I must see and eat at! I always say an article on food has to describe things other than flavours to really bring it to life and this was an utterly fascinating read. Who knew croissants probably originated in Vienna? Not me, for sure!